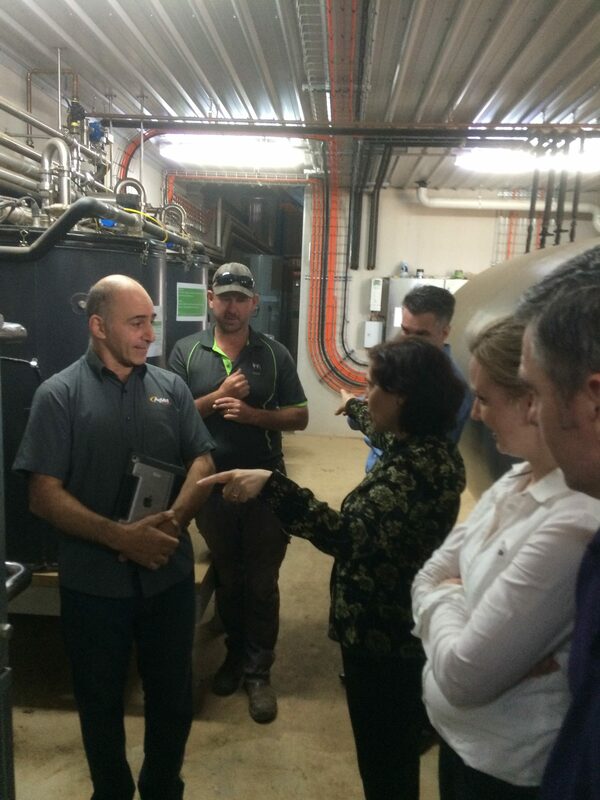 Smart and innovative ways that reduce enery consumption and improve energy efficiency were on display yesterday when we were visited by the Minister for Energy, Environment and Climate Change Minister for Suburban Development, The Hon Lily D’Ambrosio MP. It was an opportunity to demonstrate how technology and specialist know -how have come together on Chris & Charmaine Bagot’s farm in Jindivick to lower operating costs, reduce electricity demand and mitigate greenhouse gas emissions. This 50 unit dairy currently milks 450 cows. It takes pride in having carefully considered how demand for energy can be minimised and the energy used is a productive as possible. The Minister saw first-hand how the Green Cleaning System uses waste heat as its source of energy. This low temperature, energy efficient, re-use system for cleaning milking machines uses up to 97% less energy than a conventional hot water dependent cleaning system. We thank the Minister for the interest she showed and the insightful questions she asked. Load shifting is another way this dairy is reducing the demand on grid electricity. This has particular relevance in Victoria during the afternoon over the summer months. Demand for electricity can peak between 4pm – 7pm when all the equipment at the dairy is running. Removing the need to operate some of this equipment during this time can be helful in maintaining grid stability. The dairy at Jindivick does this by load shifting. For example, yesterday energy from the sun was a little patchy, yet the whole day’s milk was cooled to 4 degrees using the solar PV system. There was hardly any demand on the grid to cool the milk. This meant that yesterday the cooling of milk and heating of the solutions for cleaning the milking machine only cost about one to two dollars. And, there were no greenhouse gas emissions related to yesterday’s cooling activities – a great thing. We are still fine-tuning the system and we can see more opportunities to reduce electricity demand and lower costs.